It's so much easier to concentrate, to be productive and creative if you have the perfect space to work in. With comfort, style and elegance in mind, we have a wide range of desks and french-style console tables for you to choose from. Perfect furniture for your office, study or bedroom. 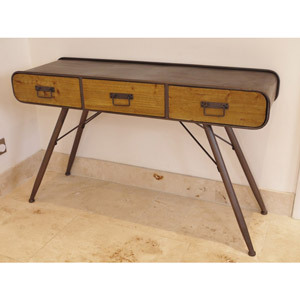 From the luxury of our twin pedestal desks that offer plenty of surface space and drawer storage to smaller console table style desks that are perfect for a more compact room. With plenty of styles to choose from in stunningly ornate French design, to the rustic and the more modern, retro loft living style. Specialising in painted furniture, we also have the colours and finishes that will match your decor in the popular colours of cream, white, grey and brown to the ornate mirrored. With practicality and comfort in mind, we want to help you design your perfect working space. With coordinating furniture available that will complement any style and taste, look no further. Create the room to match your creative flair and make your work enjoyable!